Teva is North America’s foremost Jewish Environmental Education Institute. A program of Hazon, Teva strives to transform fundamentally Jewish education through experiential learning that fosters Jewish, ecological, and food sustainability. In working toward this mission, Teva’s programs touch the lives of over 6,000 participants of all denominations annually through our work with with Jewish Day Schools, Congregational Schools, Synagogues, camps, and youth groups. This summer, Teva is traveling throughout the Northeast on a mind-bending adventure to open minds and stretch imaginations, showing communities all along the east coast the power we have as individuals to change the course of history and flip the environmental damage we see around us on its head! And what better way is there to spread this message than on a Topsy-Turvy School Bus that runs on used vegetable-oil collected from restaurants along the way? On our tour we’ll be building, celebrating, and strengthening the communities we visit through innovative learning methods and grassroots action around Jewish values and renewable energy topics. We’ll stretch mind muscles, dream big, connect to ancient ecological wisdom, and discover creative ways to re-think energy and conservation issues, from worm composting to human-powered bicycle generators. We live in a world where limited resources are overused and quickly discarded, where pollution poisons waterways and the air we breathe, where our food production methods are unsustainable and unhealthy, and where people are losing their connection to the natural world. On this tour we will show people that we do not have to accept environmental degradation as the norm and that the power of positive, forward thinking individuals of every age can impact the entire planet. What could we achieve for the planet and ourselves if we re-envisioned our consumption patterns? What could we accomplish together if we focused on alternative forms of energy and re-examined how we treat the land and our conventional farming practices? In what ways can each and every one of us be an agent of Tikkun Olam, or rebuilding and healing the world? Help us begin to find the answers to these and many as yet undiscovered questions along our journey. We’re with Lila (AcroYoga). We’re in jacksonville!!!! We’d love to host you all. These are the coolest kids in the Universe! Thanks for all your LOVE at the Hostel in the Forest and for living the responsible, sustainable intention of the Creator! I hope you made/make it to see Keith! It was a privilege to host 6 wonderful young people while they were at the Meyer Jewish Academy in West Palm Beach. We wish them safe passage as they travel the country putting a Jewish face on the importance of being mindful about how we treat the Earth. Our kids had an amazing time with the Topsy Turvy Crew! Who knew chocolate chips could taste so amazing baked in hand-made solar ovens?!? And of course hosting you guys for Shabbat was beyond exciting for all of us! Safe travels! With much love and appreciation! I am a student at Warren Wilson College, about to graduate with an Environmental Education major, and a fellow Jew. I have a school bus here on campus that i want to convert to WVO and do something similar to you all, and i was just told not 30 min ago that you were here, but then left before I could meet you! Alas indeed but good luck on your voyages. 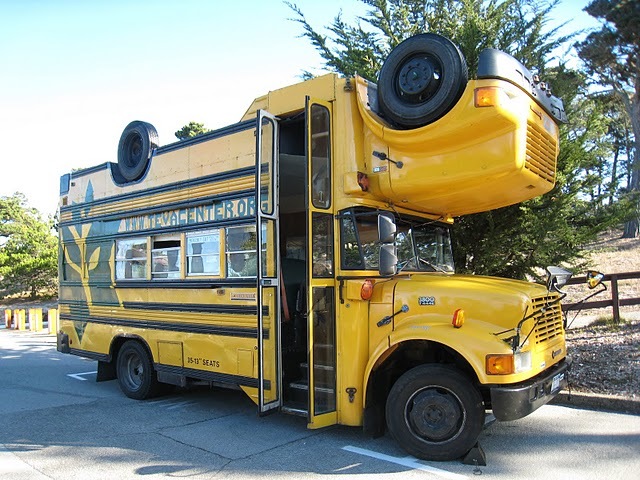 I was honored to know Tom Kennedy who built the topsy turvy bus amongst other art cars. He was an innovator and thinker outside the box but was tragically killed 2 years ago. It’s wonderful to see his art and memory still strong for causes like environmental justice. I just found this on the web and i think it is AWESOME. Are you coming back to Philly soon —- I’m sure my daughter’s synagogue preschool would love a visit. We love Philly! Keep in touch, and maybe we’ll be able to visit soon! Do y’all still have the bus? Using it? There’s this art car parade in Houston, May 12, 2012. Tom Kennedy, main artist of Topsy Turvy, was very involved in Art Car Weekend early on. 2012 is our 25th Anniversary! That is a great picture. Love it! I was born 50 years too soon! Must be on your way to Mass.